Kingston's Mom: Memorial Day Weekend '09! Just real quick before we get this party started, please feast your eyes upon my sweet little boy who I wrote the last post about. See what I mean? I think my mom is right. It's the Terrible 2's at 17 months. Luckily, or not, depending on how you want to look at it, he is pretty well behaved in public or at other people's houses. I guess he just saves the nastiness for me. Lucky, huh? So Memorial Day weekend. Here it is! So far so good. Tomorrow we plan to spend some time with Nana and Grandpa on their boat in Manteo. Should be a good time. Yesterday we spent most of the day at the beach with the Breiholz families. It was a gorgeous day and we stayed out there for about 4 hours. 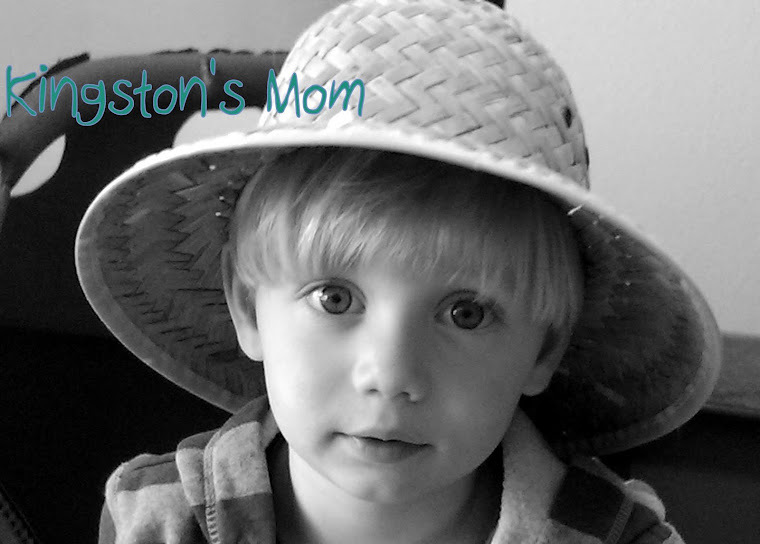 Kingston may, or may not, get his physic from his mama. Look at that belly! I wear a tankini to cover mine, thankyouverymuch. This kid is obsessed with the ocean. I cannot keep him out of it. Nigel surfed for a bit and when he came in, Kingston walked right out to meet him in the water. Nigel sat him on his board and let him float over some waves. Made me a little nervous, I will admit, but I know Nigel had a good hold on him! Kingston was loving it! His eyes were so excited and the grin on his face was priceless. Of course I didn't have the camera handy at that minute, since I had been chasing Kingston around and trying to keep him from going out in the water alone! I swear he would just walk right out to sea if we let him. I swear it! After a long day at the beach and then naps for everyone (gotta love that, huh? ), we went to dinner at John's Drive-In. Now just let me tell you about John's. It is my all-time favorite place on the planet. It is. For lots of reasons. One of them being the Dolphin Boat, two being the milkshakes and ice cream, and a big one being the nostalgia and good memories John's has for me. When I was really little, my mom used to work there a few nights a week. I remember going to work with her and sitting in the tiny, super tiny, back room coloring in a coloring book until she got off work. Some nights she would bring us home "mistakes", too! We also used to go there a lot as a family, enjoying chocolate dipped cones, malted milkshakes and swirled soft serve ice cream. They post pictures of some families in the windows and there were pictures of us in there for many years. During the day you can rarely find a parking spot and parking there is pretty much a cluster-funk. That has kept us from going very regularly over the years. That and the fact that they used to close really early but have now started staying open a little later. Last night we went at about 5:45 and it was perfect. We didn't have to jockey for a spot and our food was hot, fresh and ready in a flash. Oh, the sound of some disgruntled teenager, or Mona or Tina (who used to be the disgruntled teenagers who now own their own businesses elsewhere) yelling out your name from the window as you wait patiently at one of the brown painted picnic tables! Heaven. And then there's the ice cream. Oh, the ice cream. Man, I love John's. Can't tell, can you? So today we had a ton of things we wanted to do. First on the list was Curren's 3rd birthday party! Kingston got all spiffed up and we hopped on our bikes and rode to the party. The party was fun but while we were there it started raining. And didn't stop. For hours. Needless to say, we hitched a ride home instead of riding our bikes. We'll go back and pick those up tomorrow! Since it was pouring and Kingston was exhausted, we came home for naps (all of us, again!) and we cancelled all of our afternoon plans. We enjoyed a delicious dinner at the Red Drum Taphouse and then came home, gave Kingston a bath, put him to bed, ate some Cherry Garcia and now Nigel is asleep in his chair. We are so wild and crazy. More holiday fun tomorrow, I'm sure. You are a busy family! Grandpa and Nana are ready to enjoy some boat time with Kingston and family. Come early and stay late!